Turner Studios opens Studio D in Atlanta for you and a guest Tuesday, March 5th 6:30p-9:30p to officially welcome the Visual Effects Society to Georgia! RSVP required for you and your guest. Registration closes 12PMET, Monday, March 4th. Photo ID and security screening required to enter. Food and beverages will be provided along with a live AR Demo and SPECIAL ANNOUNCEMENTS FOR WHICH YOU HAVE ALL BEEN WAITING! VES Australia Members and a Guest are invited to a screening of 20th Century Fox's ALITA: BATTLE ANGEL. Please RSVP below by Saturday, March 2. Seating is limited and will be available on a first come, first served basis. Please join the VES New York Section for the 5th Annual VES Awards after-after party as we celebrate the finest achievements in visual effects artistry - from New York's VFX community to the VES Award winners around the globe. This year, the Visual Effects Society's New York Section is proud to present the 2019 VES NY Empire Award to Bob Greenberg and the 2019 VES NY Empire Innovator Award to Jonah Friedman and Andy Jones. Bob Greenberg, Founder and Executive Chairman of R/GA, will receive the 2019 VES Empire Award in recognition of his trailblazing work in the advertising and communications industry for nearly four decades. Under his tutelage, R/Greenberg Associates and R/GA Digital Studios have been on the forefront of the rapidly changing visual effects industry since the 1970s and evolved from a world-class movie title shop, to a digital studio, to a major digital advertising agency. Today RGA is an all-in-one full-service agency, product and service innovator. R/GA developed leading-edge motion graphics live-action film and video production and created groundbreaking visual effects for movies such as ALIEN, PREDATOR, SE7EN and has a body of work spanning 400 feature films and 4,000 television commercials. Bob has won almost every industry award for creativity including the Academy Award, D&AD Pencils, Cannes Lions lifetime achievement Lion of St. Mark, the CLIP Lifetime Achievment Award, and has been inducted inot the Advertising Hall of Fame, Marketing Hall of Fame, and the Creative Hall of Fame, and more. Jonah Friedman and Andy Jones will receive the 2019 VES Empire Innovator Award for their technological innovations that have dramatically influenced and elevated the status of the visual effects industry in New York City. 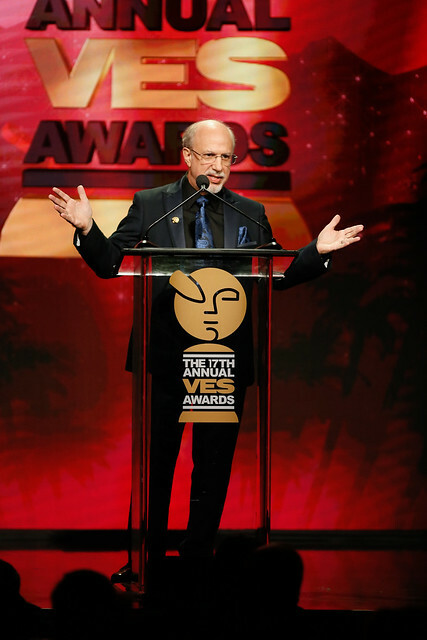 The VES NZ Section invite you to join us in celebrating the 17th VES Awards results. VES members are actively encouraged to attend. If you have colleagues who have been thinking about becoming a VES member, bring them along! We'll have board members available on the night to help anyone apply on the spot or just answer your questions. Please contact the local Board for directions. Join us for the second VES London Pub Night of 2019! Once again, we invite VES members, friends and everyone interested to a fun evening at the pub. Come join the VES London Board and other visual effects professionals for some good conversation, a beverage or two, and new contacts. We have the cozy upstairs room at the Ship Fitzrovia to ourselves, complete with a private bar! As always, this is open to everyone, no need to RSVP, so bring your friends. Feeling peckish? The Ship allows outside food to be eaten at the pub so feel free to order in or bring some take away with you.